Boil onion & cashew nut to make a fine paste.Grind tomato to a fine paste separately. Deep fry or shallow fry the paneer (do not change colour) & keep aside. 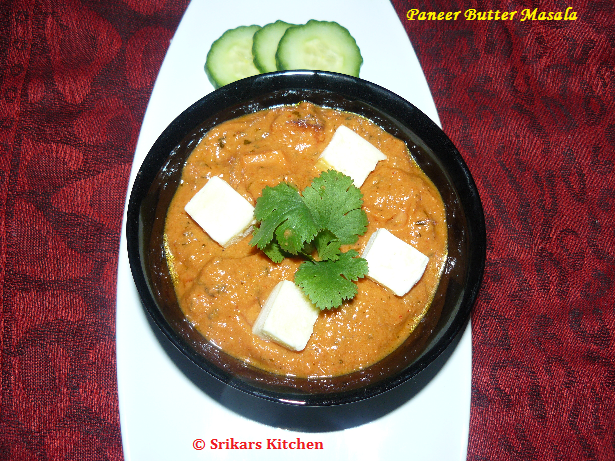 Heat butter in a pan, add cloves, cardamom,bay levaes , cumin seed, g.chilles,ginger garlic paste,onion cashew paste & saute few mins. Add red chilli powder,turmeric powder,garam masala powder, coriander powder to cook until raw flovours extacts. Add ground tomato paste , Dried kasturi methi & allow to cook. Add Yohurt (or fresh cream) to mix well. Add dried paneer & check the seasoning. Mix gently & finish with honey. Serve hot with chappathi, naan, or rice. Hmm I am ready to dip my naan in ur bowl, looks really fantastic! Long list of ingredients... guess that is what makes this special. Looks nice and creamy. my god.. looks very delicious.. i will try this method next time. restaurant style madri iruku.. Loved the rich color of PBM. You have few awards in my blog. this looks really good..am going to do something with paneer..am craving for it..
woooooooooow my fav looks sososo mouthwatering yummmmmmmmmm. 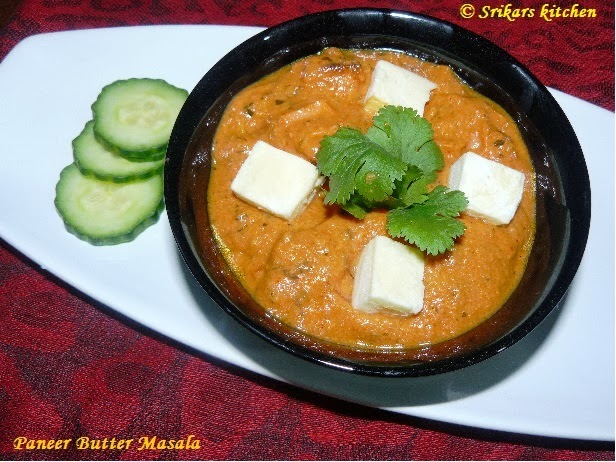 Hmm..like Cham..I too feel like dipping my butter naan in that creamy paneer butter masala...looks absolutely delicious and the pictorial is amazing!! I read the title as peanut butter masala and searching for the peanut butter in ingredients! Silly me! Looks so good and mouth-watering. Yummy! Wow yummy, tempting, alluring, awesome recipe. Love the color. It's been so long since I had it.. looks great. Wow i would love to have them now with rotis, looks so yummy , creamy and drooly delicius. I would like to receive your posts Via Google Reader pls add the subscribe via reader so I can get your posts first hand. Lovely colour sri, very tempting. Looks so creamy ...My daughter would love it ..